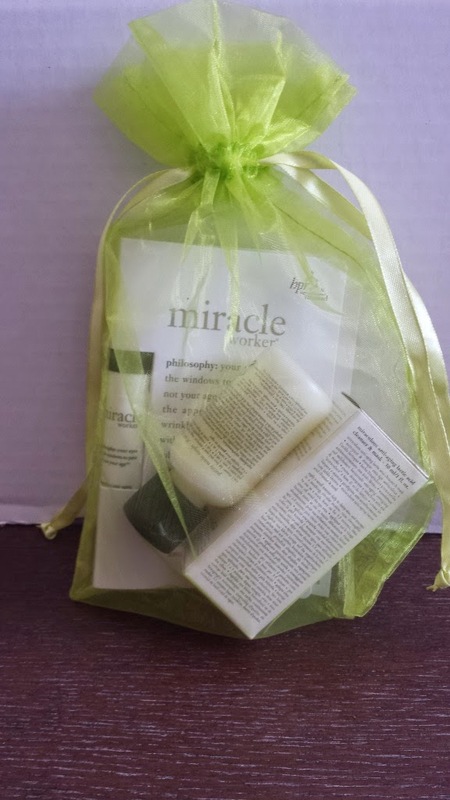 This month my TopBox selection was philosophy beauty and skin care. 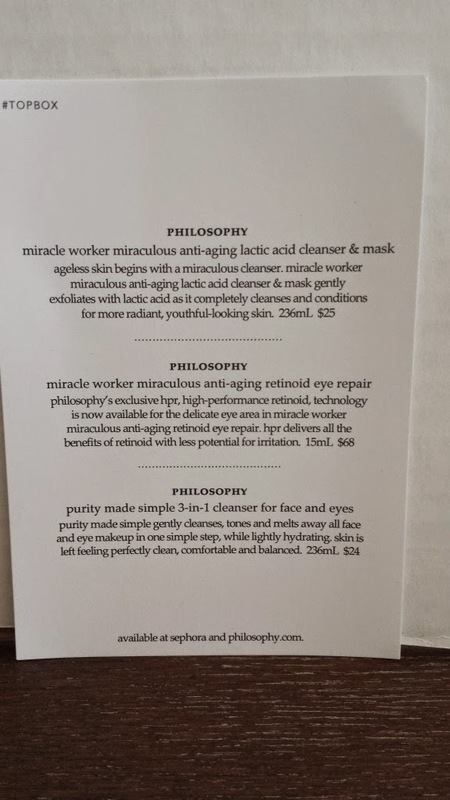 I have used philosophy products on the whole and as you will see. There are 3 items in this month's box. All these items are sample-sized. 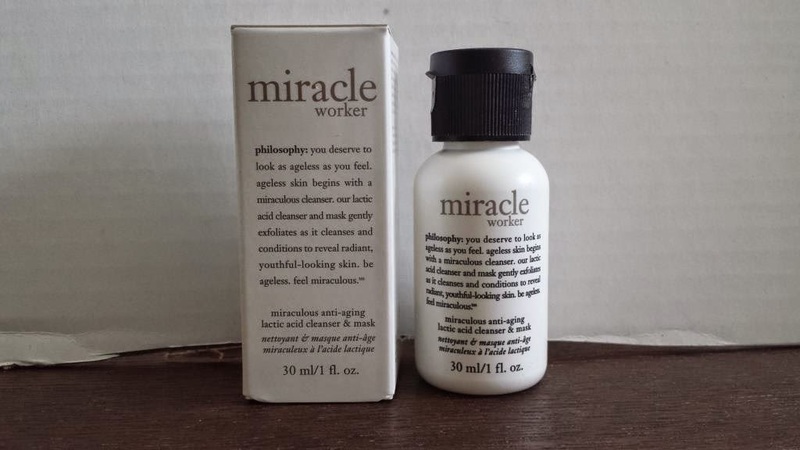 First up is miracle worker miraculous anti-aging lactic acid cleanser & mask. I've never used it before and am pretty excited about trying it. Lactic acid is one of the most used AHA's out there. It's a derivative of soured milk and we all know how Cleopatra loved her milk as a beauty product. An 8oz (236ml) bottle costs $35 on the philosophy website. The card insert says $25 so I don't know. My sample is 30ml so about $5. 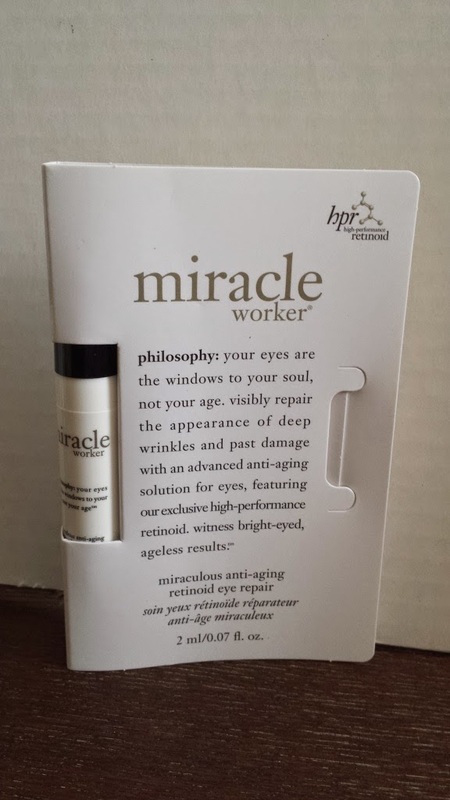 Next item is Miracle Worker Retinoid Eye Repair Cream. I'm 42 years old and the fine lines are appearing around my eyes. Couple that with dark circles and I'm prime to use this stuff. Priced at $68 (from the site) or $79 at Sephora Canada for .5fl oz. My sample is .07fl oz so about $11. 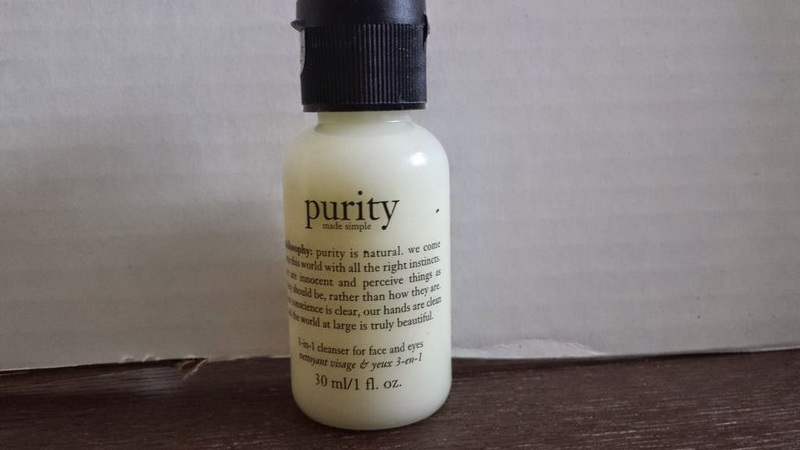 The final item is purity made simple 3 in 1 cleanser for face and eyes. I've used this product a number of times, via gift packs from Sephora or in subscription boxes. I really like it. It is effective for waterproof makeup and doesn't leave my face tight like some cleansers have a tendency to do. Price is $11 for 3oz (from the site) or $13 on Sephora Canada. My sample is 1 oz. Approximately $4. I am really quite happy with this month's subscription. Value is about $20 which is more than I paid. I really don't care as there are 2 items that I have never used before.